Travel enthusiasts who have long dreamt of a road trip in the scenic hills in Uttarakhand can now rent high-end bikes such as Royal Enfield and Harley Davidson for a truly memorable experience. The State Transport Authority (STA) on Monday granted licences to five private players under 'Rent a Motor Cycle Scheme', which was launched by the Centre in 1997. The licences will allow them to rent bikes to travellers who wish to ride the vehicles on the hilly roads. Travellers can choose daily, weekly and even monthly rental plans. The move is aimed at boosting tourist inflow in the state by providing visitors convenient options to travel. Additional transport commissioner, Sunita Singh, told TOI, "Five applicants have been granted licences to run the business of renting motor cycles. The licences have been issued for Dehradun, Mussoorie, Rishikesh and Tehri. Along with boosting tourism, it will also increase the range of last-mile connectivity." Once issued, the permit will allow the rental service to offer two-wheelers, including high-end bikes such as Royal Enfield and even Harley Davidson. The bikes available for rental will be commercially registered. It is not clear what the rental charges will be and whether they would vary depending on the service provider. 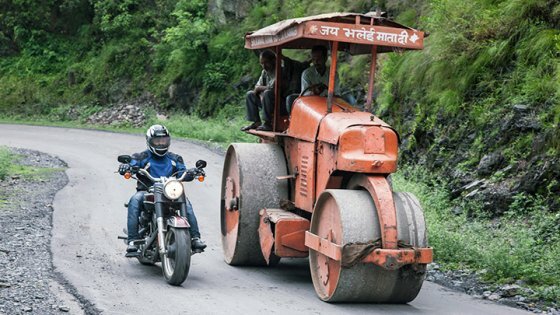 According to Sandeep Saini, assistant regional transport officer (ARTO) administration, Dehradun, "Under the scheme, two-wheelers will have a commercial registration but anyone with a private driving licence will be able to drive unlike in case of commercial vehicles for which a commercial driving licence is mandatory." There are certain conditions which a permit holder has to fulfil before starting the business of renting of motor cycles for self-driven trips. "The applicant must have minimum five motor-cycles duly covered by permits issued by STA with comprehensive insurance, fitness certificates and tax paid up to date. Besides, the operator must have at least one telephone which is accessible throughout the day and night and his financial resources should be sufficient to provide for the continued maintenance of the vehicles," said Saini. Renting bikes is very popular in tourist destinations such as Goa, where a traveller can rent a bike for around Rs 300 per day. Many bike rental options have cropped up in Rishikesh in the last two years, which are quite popular among foreigners. However, only some of them have government approval, said a transport official. The STA hopes the scheme will pick up in Dehradun, Mussoorie and Tehri as well. The scheme has received much appreciation among travel aficionados. Vidit Sharma, a local, told TOI, "I am so happy that the bike rental scheme is coming up in Dehradun and Mussoorie. All my friends have bikes and now I would be able to rent a bike and join them on a road trip." Another local, Vivek Khare, added, "Like Goa, tourists will now rent bikes and explore Uttarakhand. It will be a boon for tourists who prefer to self-drive instead of a taxi. I am going to plan a trip to Almora soon." The move has not only delighted the globetrotters but also generated excitement among bike enthusiasts in the city. Some said they cannot wait to take the high-end bikes for a spin around town.